Easy Street, originally uploaded by Michael Mitchener. I'm always fascinated by indoor furniture in outdoor settings. Generally this happens whenever someone decides to get rid of an old piece of furniture and puts it outside for garbage pickup or if they're hoping someone grabs the item for a second life elsewhere. Whenever I come across a scene like this, whether I have a camera with me or not, I mentally look for the photographic possibilities. 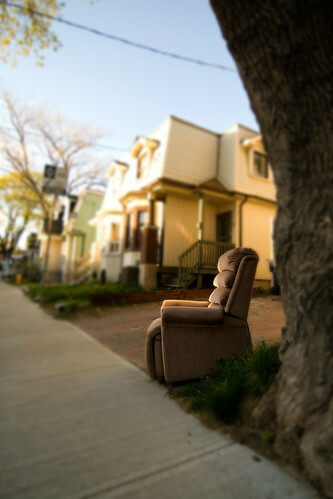 A true connoisseur of the art of street furniture is Toronto photographer, Gabi~ who can be found on flickr.com. Check out her amazing Lazyboy Collection to see how to do it right and to get an idea of how frequently you run across a variation of this shot within the city. On behalf of all photographers, students, and feral cats, I thank anyone who has ever left a big, old, red, love-seat on the curb and I'll remain on the lookout for the next street furniture opportunity.